Professional Woodworker 35 Piece Router Bit Set, which comes in a well constructed wooden box, has a variety of bits for any job. Every bit blade is constructed of tungsten carbide steel while the body of the bit is constructed of high carbon steel for increased durability. Bits included are: 10 straight bits, 1 mortising bit, 1 classical bit, 2 core box bits, 2 90 v grooving bits, 1 dovetail bit, 1 panel pilot bit, 5 flush trim bits, 3 cover bits, 3 round over bits, 1 beading bit, 1 roman ogee bit, 1 bevel bit, 1 45 chamfer bit, 1 slot cutter bit and 1 rabbeting bit. Freud's precision ground carbide bits have a grain size smaller than other grades and titanium is added making them impervious to chemical attack. Promoting safer woodworking is the reason Freud made a commitment to develop anti-kickback router bits. Bits are computer balanced to insure vibration-free operation at speeds that are a safe margin above the typical 22,000 RPMs of most routers. 35-Piece Router Bit Set Professional Woodworker 35 Piece Router Bit Set, which comes in a well constructed wooden box, has a variety of bits for any job. Every bit blade is constructed of tungsten carbide steel while the body of the bit is constructed of high carbon steel for increased durability. Bits included are: 10 straight bits, 1 mortising bit, 1 classical bit, 2 core box bits, 2 90 v grooving bits, 1 dovetail bit, 1 panel pilot bit, 5 flush trim bits, 3 cover bits, 3 round over bits, 1 beading bit, 1 roman ogee bit, 1 bevel bit, 1 45 chamfer bit, 1 slot cutter bit and 1 rabbeting bit. 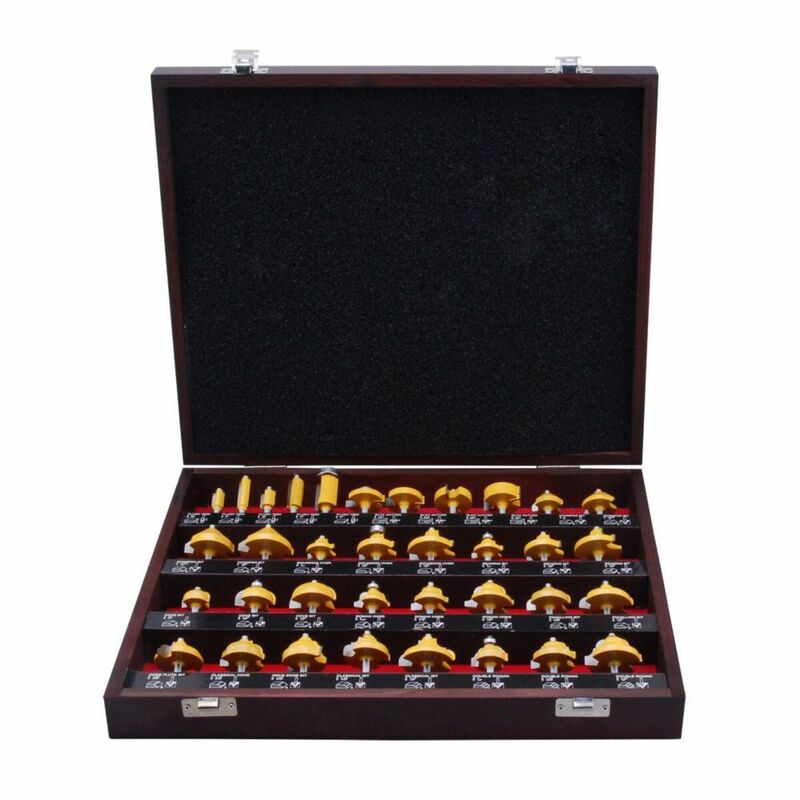 35-Piece Router Bit Set is rated 3.8 out of 5 by 58. Rated 5 out of 5 by Anonymous from Bought for my son, who is a carpenter, by trade. He was very pleased with the set. So many bits, ... Bought for my son, who is a carpenter, by trade. He was very pleased with the set. So many bits, all displayed in a very nice carrying case. Rated 5 out of 5 by DoItYourself from I bought the set to do edge routing of my custom hickory cabinets. This set has at least a dozen ... I bought the set to do edge routing of my custom hickory cabinets. This set has at least a dozen special bits that are not in the sets I own. I routed ten different edges before deciding on the one I wanted. I routed 38 doors/drawer fronts with no issues at all. The only negative is the set does not include a lot of bearings. I assume that more bearings would increase the price. The bearings are easy to swap, so it is not a more big deal to me. Rated 5 out of 5 by Mark from So far I’ve only used 1 bit but, seems to... So far I’ve only used 1 bit but, seems to be a great addition especially for the price! Will this set fit 1/4 inch shaft ?